A class action was filed against Naked Juice, (owned by PepsiCo), for marketing products as non GMO and All Natural when in fact the product contains genetically modified ingredients and synthetic substances. The complaint can be accessed here. 1) Labeling its products as “Non-GMO” when, in fact, it knowingly used genetically-modified ingredients in its products. * Fibersol-2 — a proprietary synthetic digestion-resistant fiber produced by Archer Daniels Midland and developed by a Japanese chemical company. * Fructooligosaccharides — a synthetic fiber and sweetener. * Inulin — an artificial and invisible fiber added to foods to artificially increase fiber content with the typical fiber mouth-feel. 3) Intentionally misleading and deceiving its customers. 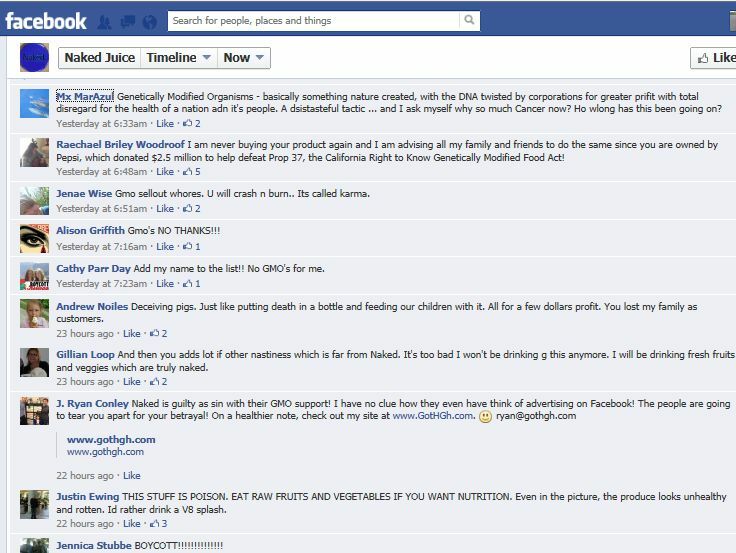 Consumers as evidenced on Naked Juice’s facebook page are not only boycotting the product because of misleading advertising but the companies $ 2.5 million donation to defeat California proposition 37 which would have made GMO labelling in California mandatory. ← Scientific basis to farmer reports of increased gastrointestinal disease in animals fed GM Roundup Ready Soy.